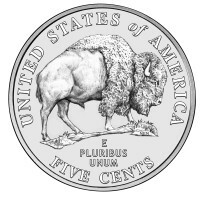 A new nickel? Did we really need another new nickel? Nice write-up at Spacetown, complete with pictures (high resolution images here). The new portrait of Jefferson is ok, though I note that one of the two reverse designs shows a startlingly accurate picture of a bison (zip file of a 1.5 MB JPEG), though possibly not a worksafe depiction.